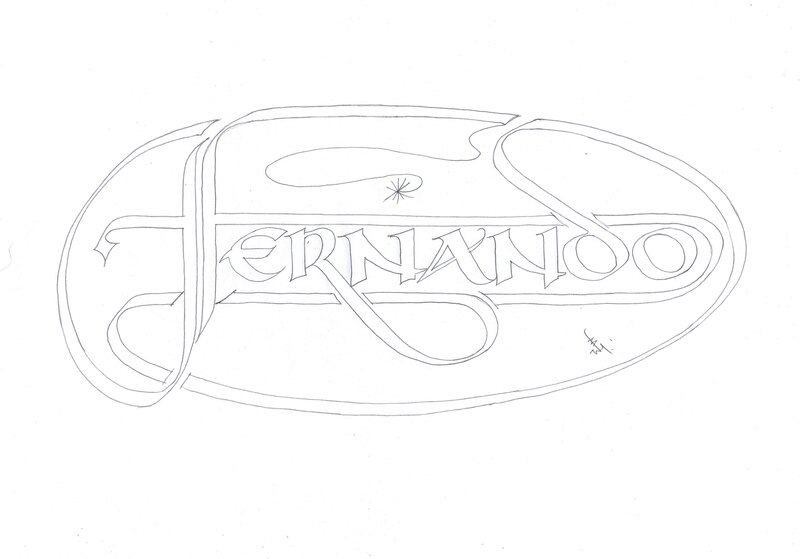 The winner of the Competition, Fernando Lembo di Pino , himself a very gifted and accomplished scribe has asked that the doodle should consist simply of his name Fernando. So, hoping I can make something worthy of his skill, here we go. It has been a long time since the competition and due to much busy-ness and business I have only now been able to bend my mind to what should really be a mindless excercise, ie a doodle, though I must say I have been giving it quite a bit of thought lately. 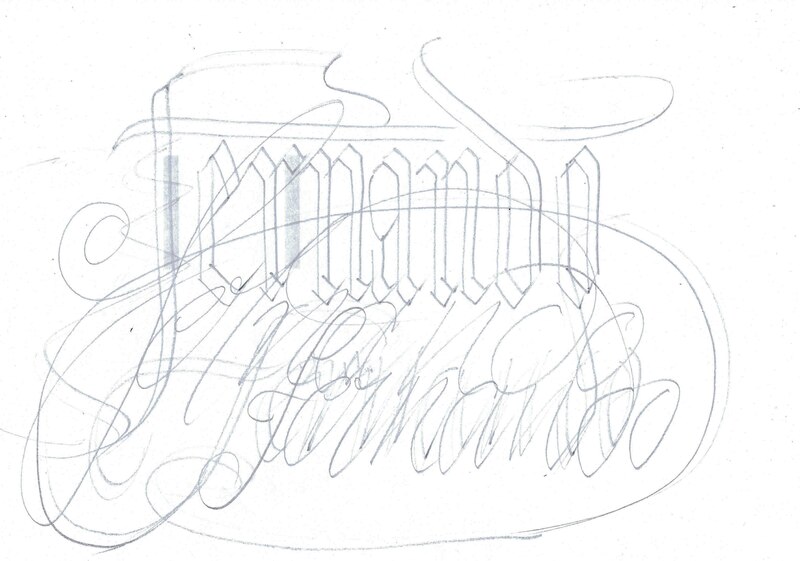 As promised, I have tried to document the making of a Namedoodle and the thought processes that make it what it is. So a sheet of A4 scrap paper first with some double pencils and doodle doodle doo, we begin. 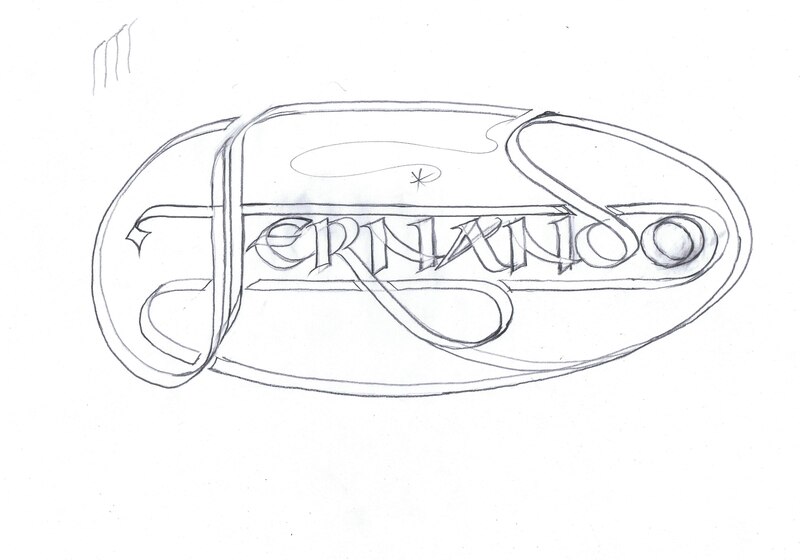 Then having started with OE Black-letter and a bit of italic, I can see some of the ideas coming through. The extended cross stroke on the F and the enclosure of the whole, enclosed within a cartouche composed of the tail of the same letter. More mindless doodling. 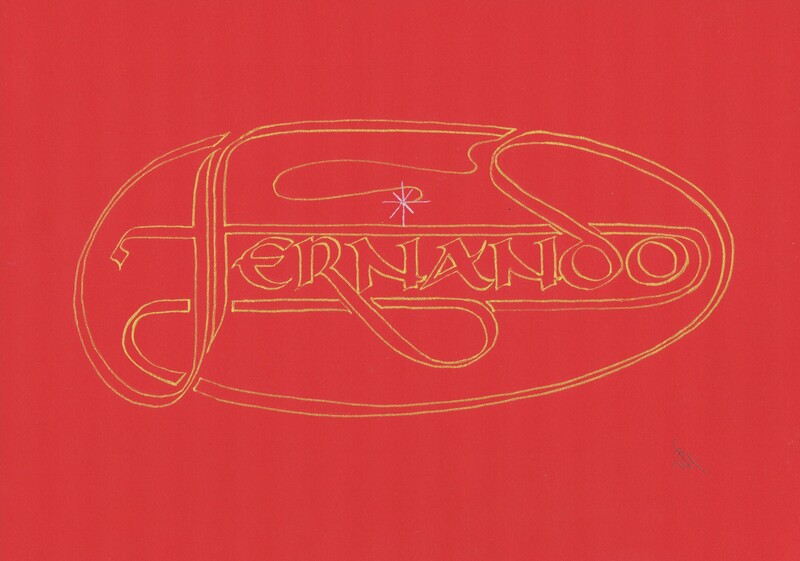 Fernando, Fernando, etc. This is more or less the layout I had in mind, so, time to stop playing and put it into practice. Usually my Namedoodles are completed on size A4. Here, I must admit, I cheated a little bit and switched to a sheet of A3 paper. 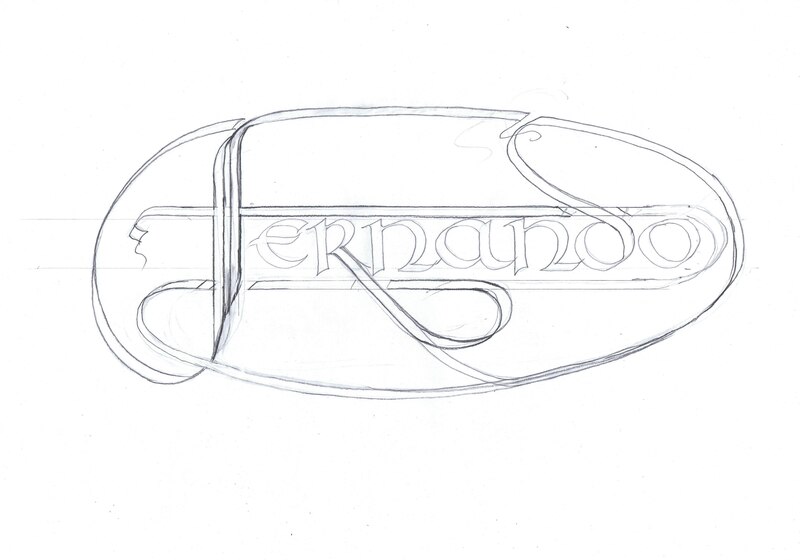 Having decided that I should change the script to an uncial type rather than Black-letter and to keep it all within the cartouche, I felt I needed a bit more room to swing around the curves. It seemed only natural to break up the flow of the line to correspond to that of the ascenders, and to continue the line of the cross stroke round to join with the closure of the cartouche. At this point I found it helpful to use a set-square to make sure the horizontals were in fact horizontal. 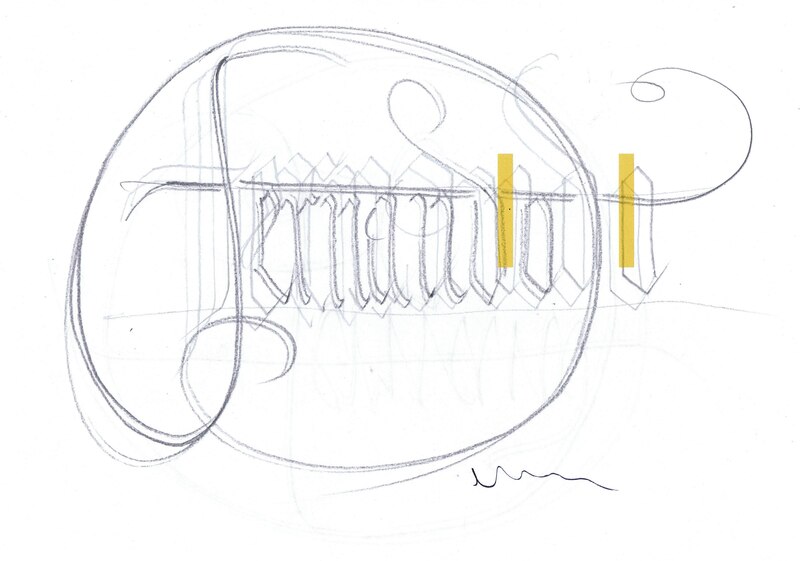 I was not too sure what to do with the tail of the R. Do I finish the stroke at the upturn, join it to the cartouche, or bend it round to become part of the closure? By the way, the x height of the letters is 1″, about 3 1/2 nibwidths. At this point I have not made my mind up about the R, but have decided to change the Ns and the A. Don’t ask me why. I suppose you could say it makes it look a bit more grown up. Now traced off onto a fresh sheet of A3 with the R problem resolved, (still not sure about this), then printed onto A4 and traced onto a nice piece of matte board, it is time to put this working drawing into action. Using a pretty firm pointed nib and Schminke gold gouache, first making sure that the nib is capable of holding enough of the medium to draw a line without having to stop too often for replenishment, and checking that the heel of my hand is able to actually slide around the curves, a deep breath and off we go. Something less than an hour later, having added a silver star and my wbg chop, I sit and pull it all to pieces in my mind. This is not quite right, should I not have done so and so? Should I, in fact, tear it up and do it again? Heheh! Experience has taught me though, that no matter how many times I start all over again, I shall never be completely satisfied. Even now I am thinking, perhaps a wash of white or pale-ish blue within the lines. Why not add a border………………………..? It is on that note that I shall once again thank all my readers and visitors for coming to see what is happening at Bill’s Space. Thanks again to those of you who entered this competition, I am sure there will be more to come. And three cheers for the winner. Fernando, you are indeed, a star. 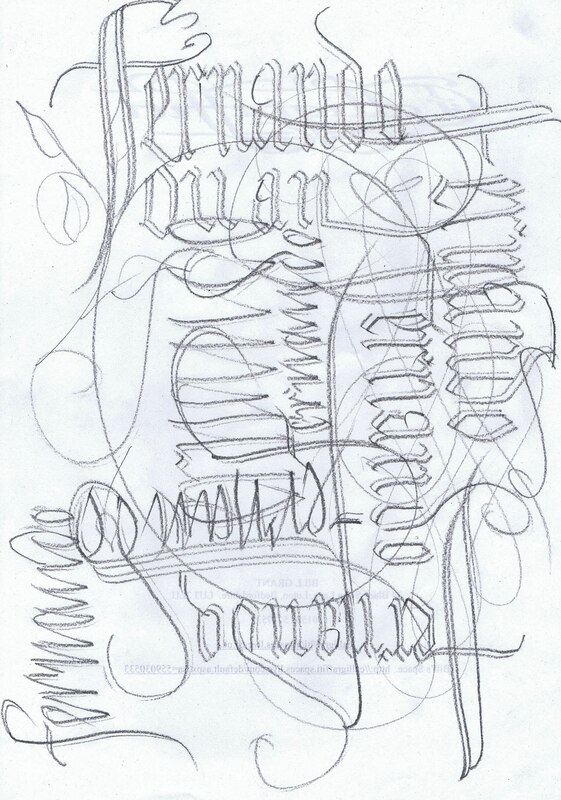 This entry was posted in CALLIGRAPHY,CALLIGRAFFITI,LETTERING,HOW TO, Namedoodles and tagged calligraphy, Competition, lettering, Namedoodles. Bookmark the permalink.